Students of history will remember how Porsche came to dominate the legendary Group C era: the Porsche 956/962 was totally reliable and Porsche built a gazillion of them, outlasting all of its faster, more fragile rivals for nearly a decade. 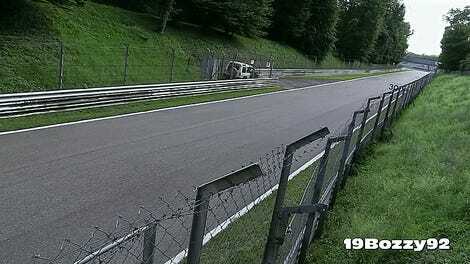 The first such car was the turbo Ferrari-powered Lancia LC2, a car too fast to win. Lancia had a weird run-up to Group C, and you need to start by remembering the often-overlooked Lancia Beta Montecarlo Group 5 car, pictured above. This was the car that finally beat the legendary Porsche 935 and in 1981 the Montecarlo won the last World Sportscar Championship before Group C took over in ‘82. Lancia built on the Montecarlo’s success with the LC1, pictured above, a sort of open-top prototype version of that car, with a stronger version of its little four-cylinder engine but a totally custom racing chassis. The problem was that the LC1 was built to Group 6 regulations and the FIA decided in ‘82 that Group C was going to be the top class for racing. The FIA said that Group 6 cars like the LC1 could compete, but they couldn’t be counted towards winning the championship. And this was bad for Lancia, because the LC1 was actually surprisingly good, beating the new Porsche 956 on multiple occasions, enough so that it might have won the championship in ‘82 if it had counted. But it didn’t, so the car got dumped. The car that replaced it was the LC2, pictured above, no longer with a little 1.4 liter four-cylinder but a big 3.0 liter Ferrari V8 with two turbochargers good for seven or eight hundred horsepower. The LC2 was amazingly fast, almost always on pole position when it competed with factory support from ‘83-’85. At the ‘84 Le Mans, a Lancia LC2 took pole a good 11 seconds faster than the next fastest Porsche. But the car often blew up, with engine and transmission failures taking it often out of contention. And while Lancia was struggling to keep its Martini-backed factory cars in the race, Porsche was filling the entire entry list for races with privateer teams, completely gaming the system. So Porsche outlasted the Lancia LC2 and we barely remember it anymore. At least we can listen to it scream. Watch this old Lancia/Martini promo film to really hear the car wail. Modern GoPro audio simply does not capture how rich and raw these things were.